PLO chief: Labelling "settlement products" isn't enough. They should be totally banned. Palestine Liberation Organization (PLO) Secretary-General Saeb Erekat on Monday called on the European Union (EU) to impose a total ban on products form Israeli communities in Judea and Samaria. “This is a crucial moment in order to save the prospects for justice and peace,” he said in a statement quoted by the WAFA news agency. 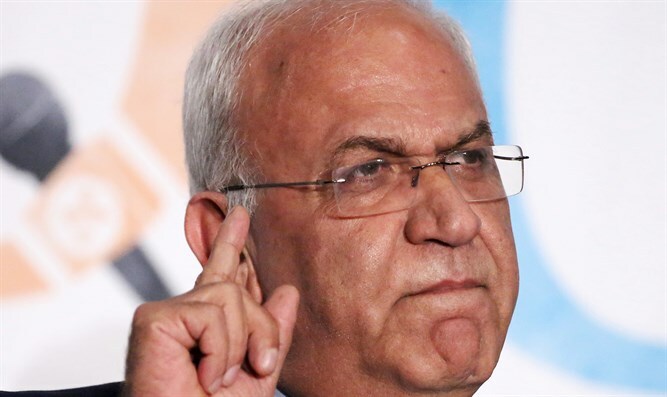 “The Israeli government believes that they can go ahead with their colonization plans and to finally bury the two-state solution, replacing it for the consolidation of a one state/two-systems reality, known as Apartheid,” charged Erekat. “There is no contradiction between taking action against Israeli violations of international law, implementation of UN resolutions and calls for resumption of negotiations. Our position regarding meaningful negotiations has been clear with our support for the Paris Peace Conference. We are at a crucial moment where concrete measures, rather than recycled statements, are the only way to move forward,” he claimed. Erekat also urged EU member states to uphold their responsibilities and recognize “Palestine”. “We have requested the EU members to uphold their responsibilities, including a few countries that have decided to reward the anti-peace agenda of Binyamin Netanyahu. We have called upon all countries who haven’t recognized the State of Palestine to do so,” he said, according to WAFA. In recent years, several countries in Europe have recognized the state of “Palestine”, including Britain, Sweden, and Portugal. In January, the Palestinian Authority (PA) inaugurated an embassy in the Vatican. Most of these moves are symbolic gestures and have little, if any, actual diplomatic effect.